Hi Lovelies~ Today I want to share my review for “ The Hunger Games”. I remember seeing the preview long time ago and was not impressed. When the movie came out, everyone seems to be talking about it. To an extent that I feel I should watch it. In the beginning the poor are randomly chosen to be the Tribute of this reality game. 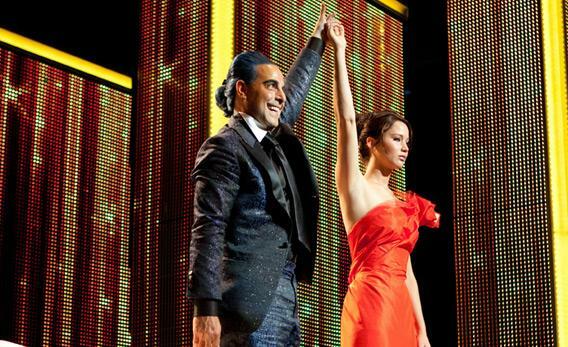 They’re divided into districts and each district have two contestants. The main character Katniss volunteers to be Tribute because her little sister was chosen. They were treated like superstars with full make over, costumes, nice hotel and meals for this “ reality show”. Of course, there were times that the scene got intense as these contestants are fighting for their lives. However, overall, it’s a pretty slow movie. I would not recommend this movie, because it’s over hyped and content is much lower then expectation. I actually fall asleep half way through the movie. Maybe I was tired but while I was awake, I found the rest of the movie quite slow. I give this movie 2.5 stars for being an ok movie. I thought the ending was lame too, although I think it’s a “ happy ending” but having a twist instead should have been more (expected, for me) and interesting. I will go next week!! Movies was not bad, but not awesome either, as it's the case with movies based on books. The book is way better though. More intense, and gives you more room to imagine things, as well as gives you perspective on the character's actions, which is lacking in the movie. This is a good Hunger Games movie review! I actually liked the movie; I read all three books within a month of seeing the movie and (unlike the Twilight series) I felt that they stayed pretty true to the book : ) Wasn't Rue the cutest? So sad what happened to her. thx ~ glad you like the review. since there are three books, does that mean there will be hunger games 2? ?